The Cure Medical® Ushaped COUDE Catheter With Lubricant is not made with DEHP, BPA or Natural Rubber Latex. Features a blue control stripe on the catheter for help inserting the catheter the correct way. The sterile, single use, U-shaped Cure Medical Pocket Catheter with Coude Tip offers men discreet portability by easily fitting in most pant pockets. Polished Eyelets: Cure Medical always uses an ultrasonic process to ensure that all eyelets on all catheters are exceptionally smooth. The difference in eyelet quality between a Cure Medical product and others can be seen – and felt. Not Made With DEHP, BPA, or Natural Rubber Latex: Supporting research isn’t the only Cure Medical distinction. Material choices and manufacturing processes also set Cure Medical apart from others. 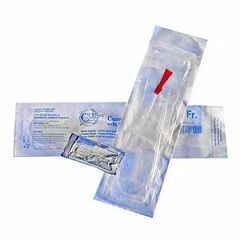 Other manufacturers often use Di(2-ethylhexyl)phthalate (DEHP) as an economical means for making catheters flexible. DEHP is included on a published list of chemicals known to cause cancer and reproductive harm according to the state of California – therefore, Cure Medical products are not made with it. Likewise, latex may be in other brand catheters. Natural rubber latex is a chemical which commonly causes irritation and can cause life-threatening allergic reactions – therefore, Cure Medical products are not made with it. User Driven Innovations: From product enhancements such as polished eyelets, unique packaging, and a hydrophilic coating option – to a coude tip with blue line and color-coded FR sizes – Cure Medical continually pursues innovations designed to improve the user experience.